Photo is from the Las Vegas Review-Journal. Let Nancy and I just say that your thoughts and prayers were definitely felt and made evident during our week in Cleveland. The week was powerfully stimulating. In fact, I would say that the week was more action packed than the other two national conventions that Nancy and I had previously attended. In fact, there was much more to do than our time allowed us. The earliest that we went to bed was the “Monday morning” that we arrived in Cleveland. We went to bed about 1:30 am that day. We were so blessed to further connect with our existing friends and make so many new friends. 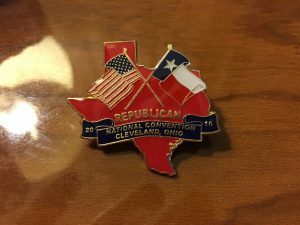 One thing that aided us in building goodwill with delegates from other delegations was a pin that the Texas delegates could order. We ordered several and we gave these out fairly freely and we also traded different states for their pins. There is something special about giving away a gift unconditionally and explaining to the recipient that they do not have to give anything in return. Nancy and I believe in divine appointments and there were so many along the way starting with our extended layover in Las Vegas, Nevada. It was really refreshing and invigorating to meet other delegates who felt as we did about some of the things that we would like to see changed in the future. We are already planning on getting together to discuss how we can make some positive changes. The entire Texas delegation also felt very much protected and at peace while there. Despite the level of threatened violence from protestors, we encountered nothing that threatened us in any way. While there, we met many law enforcement officers from so many different states and thanked them for their service. 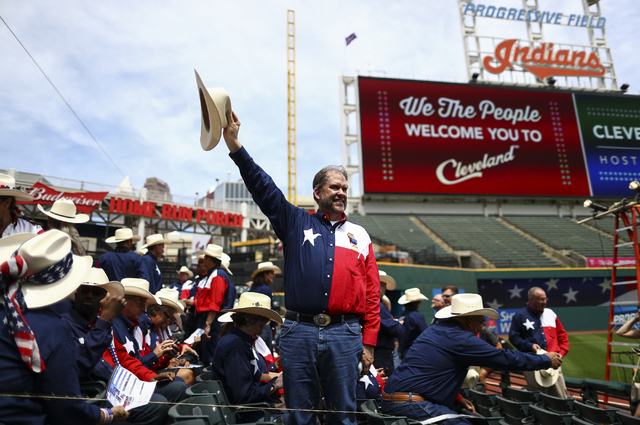 Several notable Republicans chose not to appear at the Republican National Convention. I will talk about two. Governor John Kasich was an early favorite, but not the top pick, of mine. I liked Gov. Kasich for several reasons including the fact that he was a part of the team that helped balance the budget under President Bill Clinton. However, the shine on his gold star dulled when some of his state policy actions as Governor of Ohio were contrary to his earlier positions as congressman. There were rumors that Donald Trump offered Gov. Kasich the position of Vice President but that he turned it down. However, both the Trump campaign and Kasich campaign denied that there was an offer. Still, it is the opinion of many that being a no-show at the Republican National Convention in his home state was in poor taste. There was some buzz about no one from the Bush family making an appearance. Some speculated that Jeb Bush’s poor outing contributed to that decision. Some speculated that some delegates were still a little sore at former President George W. Bush for some of his policies. Interestingly, the Huffington Post interviewed me about my thoughts and I opined that President George W. Bush probably was just sick of politics and wanted nothing more to do with it. Part of my quote was picked up by other analysts and printed in their publications as well. I also point out that in the Democrat Party there will be key figures that also will be missing from their convention which starts Monday, July 25th. For example, it has been well documented by many sources of the long-running feud between Al Gore and Hillary Clinton. It was just announced that Al Gore, the former Vice President and the 2000 Presidential nominee of the Democrat Party, would not be attending the Democrat convention in Philadelphia. I gave an in-depth analysis of the positive reasons for choosing Governor Mike Pence of Indiana for a running mate on my blog. In summary though, I feel that a current Governor from a mid-western state combined with the prior experience of a United States Congressman who had a reputation as a solid conservative will positively lift the overall ticket’s value to all Americans. Frankly, I was surprised that Senator Ted Cruz did not endorse Donald Trump at the convention. Other than that, I feel that no matter what side anyone picks on Cruz’ decision they will be attacked by the other side. For my fellow Trekkies out there, I guess you could say that this is a Kobayashi Maru test that even James T. Kirk would not want to face. Regardless of anyone’s opinion of Senator Cruz, I believe that it is undisputed that Donald Trump knew in advance that Senator Cruz was not going to endorse him. Thus, I would give some high respect remarks to Donald Trump in allowing Senator Cruz to speak. The issue that a lot of people are talking about is whether or not the boos that were made at Senator Cruz were orchestrated by the Trump camp. All I can say to that is that from where I was sitting in the gallery, while my alternate was on the floor during the speech, I did not receive any texts or other communications that suggested that delegates should boo or otherwise become disruptive while Senator Cruz spoke. Nor did I see anything that made me think that the delegates were being whipped up to boo Senator Cruz. However, others reported that they did see some Trump supporters whipping other delegates to boo Senator Cruz. As most of you know, I officially endorsed Donald Trump on June 7. Nothing that has occurred since that date has caused me to change my mind. With that said, let me add to my thoughts that I made on June 7. Prior to his acceptance speech, his wife and children all gave speeches. I believe that in spite of the overblown reaction to Melania’s speech, that the speeches given by Ivanka, Tiffany, Eric, and Donald Jr. were outstanding. As one observer put it, Donald Trump had to do something right to raise four kids that turned out so well. Trump’s youngest of five children, Barron, who is 10 years old, did not speak at the convention. Donald Trump’s acceptance speech was the final event of the action-packed week. His overall theme of making “America First” resonated with the delegates in attendance and with the rest of America. In summary, he pledged to “Make America Safe Again,” “Make America Work Again,” “Make America First Again,” and “Make America One Again.” Trump’s speech included some very specific points including building a wall on the Mexican border and doing away with some of the treaties and trade agreements that do not first advance United States’ interests. In closing, I cannot thank you again for everyone’s support of Nancy and I while we were in Cleveland. Being able to focus completely on the tasks in front of us while things back home were watched and cared for will always be remembered. And to answer your question, “Yes,” I will be watching and commenting on the Democrats convention starting Monday. This entry was posted in Commentary, Republicans and tagged 2016, Cleveland, Mike Pence, recap, Republican National Convention, RNC, Ted Cruz. Bookmark the permalink. Miss Landis would be proud.